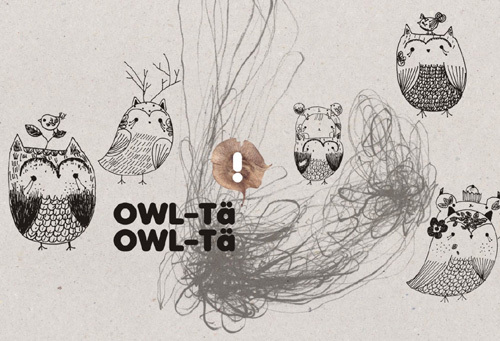 I am fan of typography and when you mix typography and owls, I love it even more! I hope you do too and enjoy this collection. 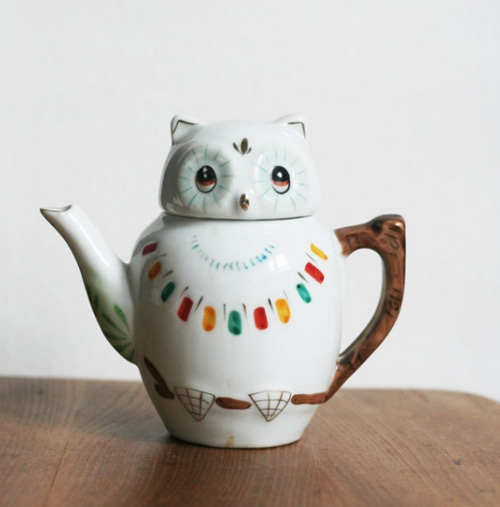 This cute owl shaped teapot is perfect for your retro kitchen! Available at Our Shop and yes, they do ship internationally. 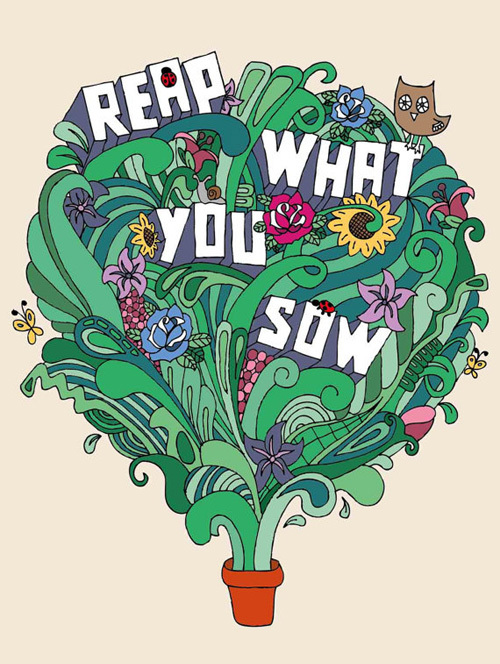 "Reap What You Sow" so, let's sow something pretty. A brilliant quotation print by Dawn Wood. Today I have not one, but two freebies for you lovely people. 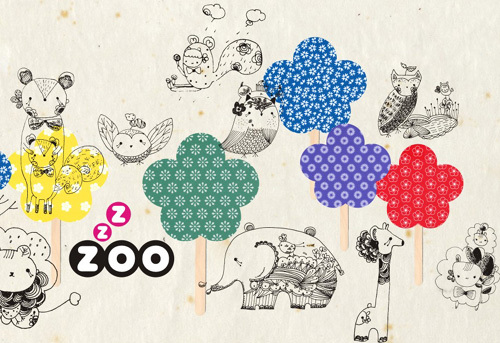 These adorable desktop wallpapers are by Kaki Creation and both are free for download! 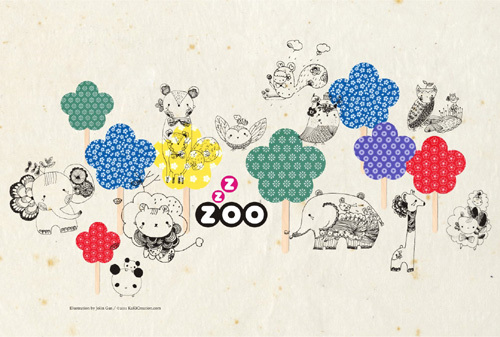 Simply click on the link below the images to go to the page of the wallpaper, click right on the image to save it on your desktop. Open the saved image and select option "Set as desktop background". Enjoy! 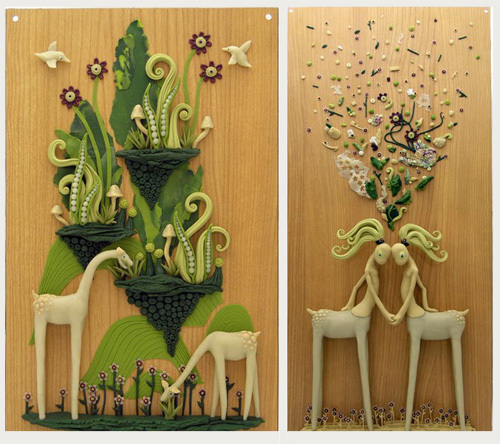 Meredith Dittmar is a Portland artist who makes intricate sculptures with polymer clay and wire. 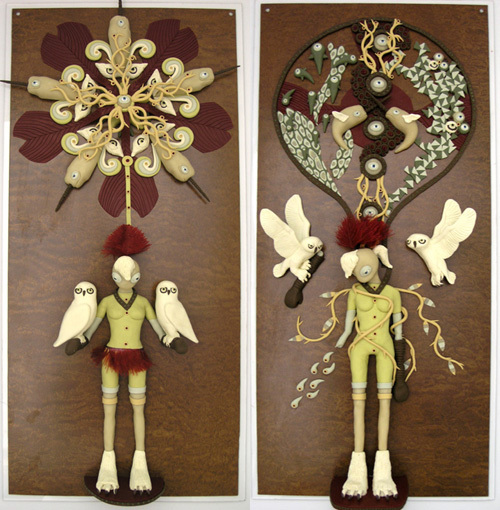 She crafts countless unique looking creatures, which she refers to as "My Guys", who live in invented landscapes inspired by diagrams, math and words that the artist has collected over time. "Her characters are frequently involved in quiet expressive moments, or lounge facing their audience so they can share their inner space." 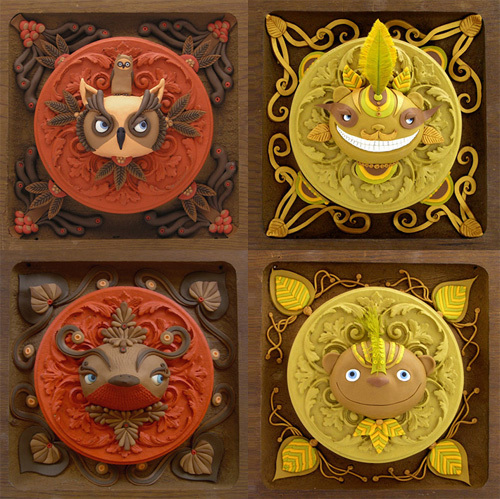 The combination of her detailed art and these colorful unique characters offer the feeling of being in a different world every time you look at her pieces. 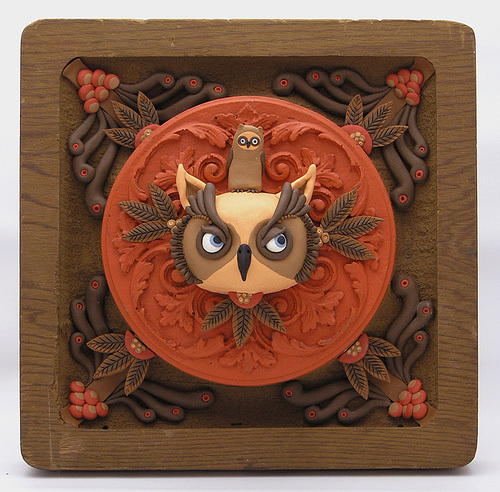 I have never seen or blogged about owl string holder before but when I saw this I knew I had to share it here with you all. 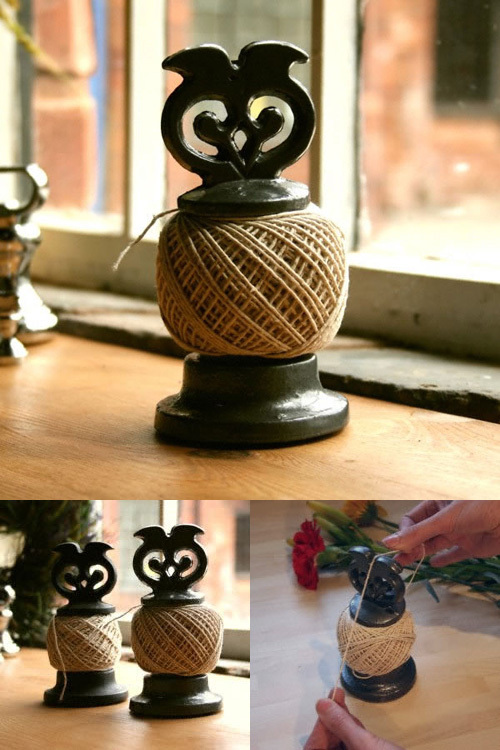 This kitschy and cute owl shaped string holder is made from cast iron and has a pull-down blade between his ears for quick and easy cutting. 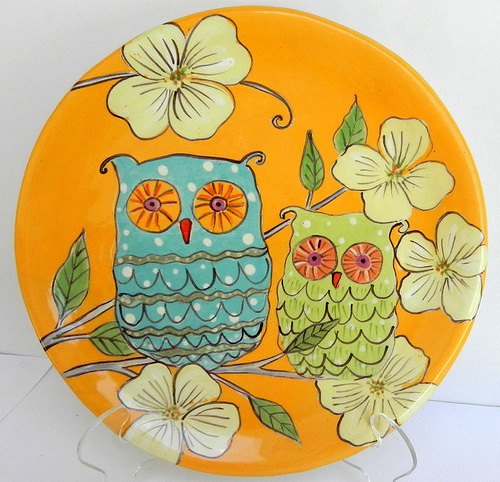 This will look great sitting on your kitchen counter or your sewing room. Available here. Thank goodness they ship worldwide. 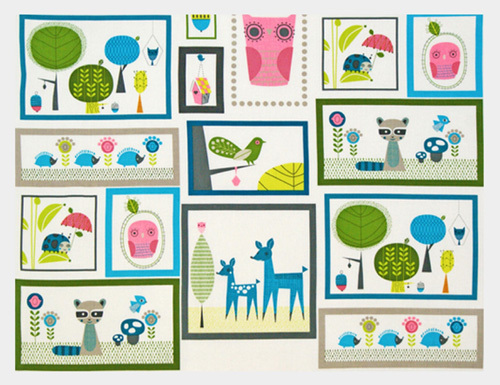 Amy Eaton is a designer based in Ontario, Canada. 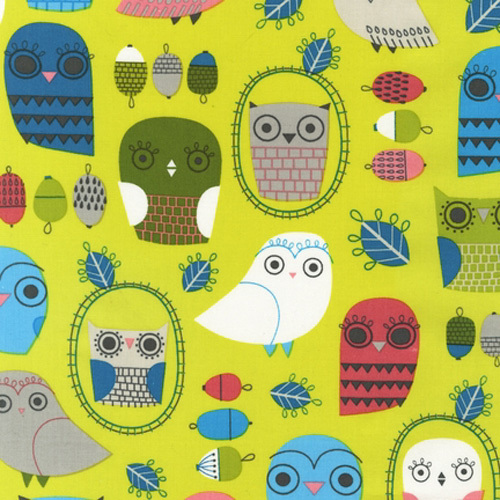 She loves patterns, knitting and owls. 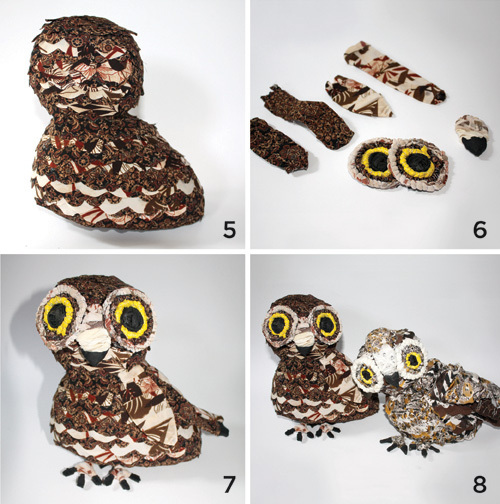 Out of her love for the bird, she prepared this wonderful tutorial that will guide you through the steps of making your own owl using old and recycled material around the house. 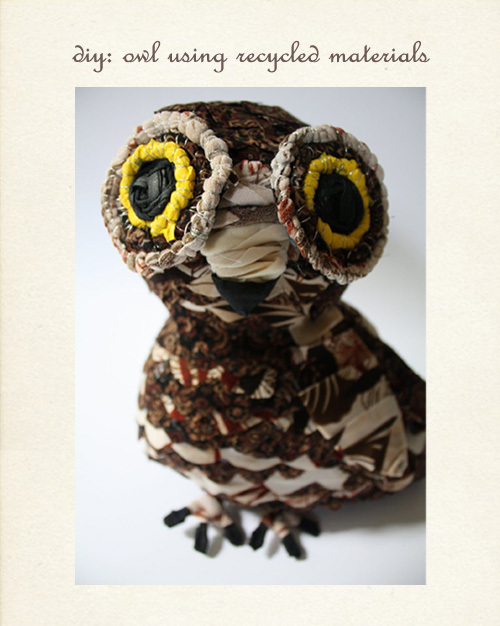 I love the organic feel of this handmade owl that can be made in any size. The following instructions and the tutorial is by Amy. 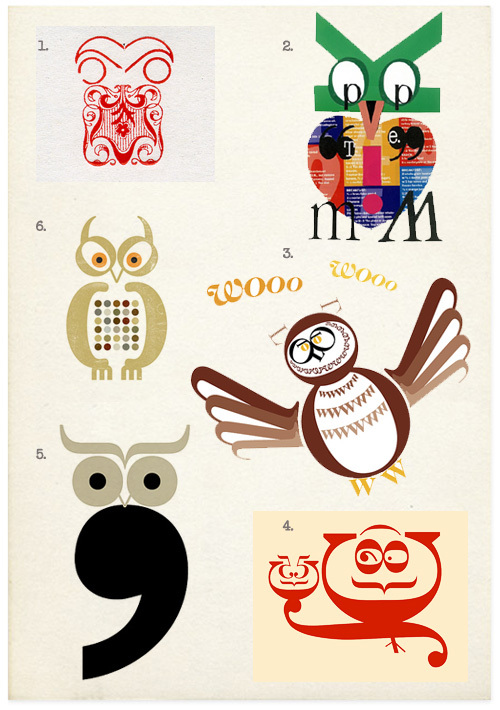 For my owl I used the following supplies, but be creative! Use what you have! 1. Use the 14 gauge wire to shape wings, feet and a nose for your owl. 2. Cut your fabric into feather shapes for the body and into strips for your wings. 3. 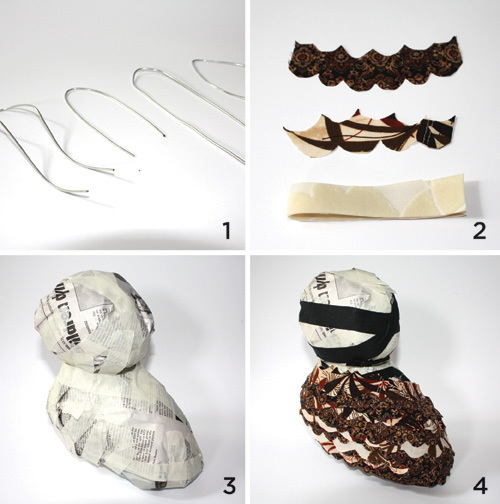 Using rocks, plastic bags, newspaper and tape, create an owl body. 4. Once you have your owl, cover the bottom by hot gluing on a large piece of fabric, then layer feathers from the bottom to top. 5. 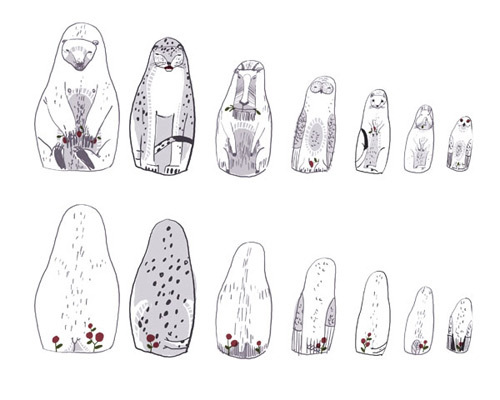 Continue layering feathers until your owl’s entire body and head are covered. To create definition on the face, use lighter fabric. 6. Cover your wire wings and nose by wrapping them in long strips of fabric. To create the eyes, first create a tape ball. Next tightly twist a yellow plastic bag and use it to form a ring round the tape ball. Continue twisting strips of fabric around the eye until you are satisfied. 7. To complete your owl cover your wire feet in fabric and use black tape to create claws. 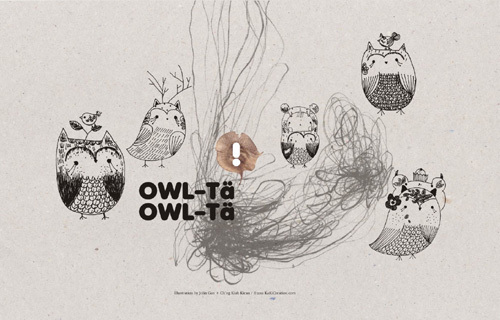 Cut a hole into the bottom of your owl and use hot glue to secure the feet in place. The final step is to hot glue your owl’s face and wings on. 8. 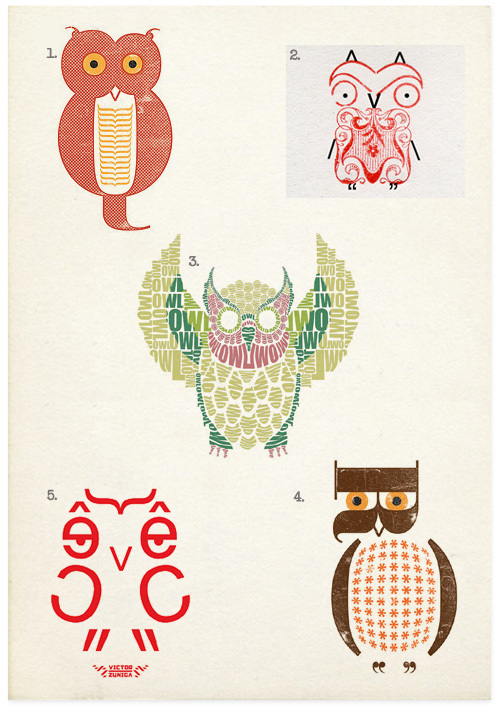 Feel free to make friends for your owl, you wouldn’t want him to get lonely! 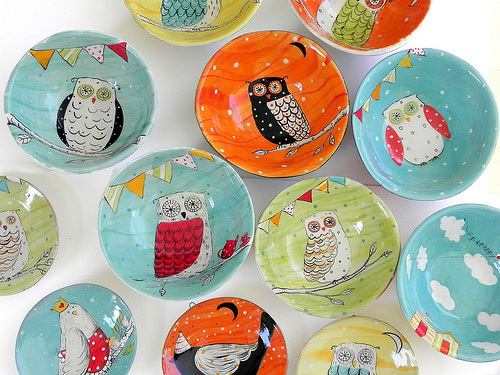 A ceramist Joy Elizabeth was trained in Illustration at Ravensbourne Art College in Chislehurst, Kent, UK and now teaches art in a school in Florida. 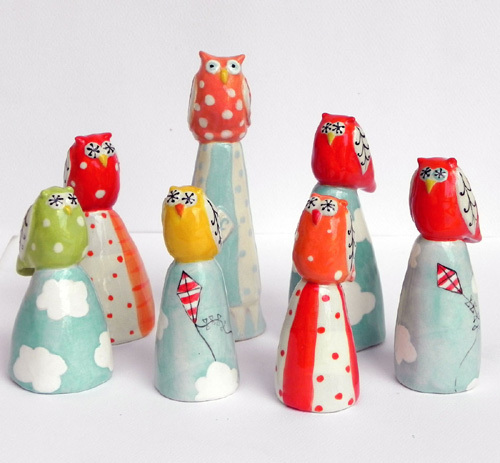 She loves to draw and paint, but her true passion has always been working with clay. 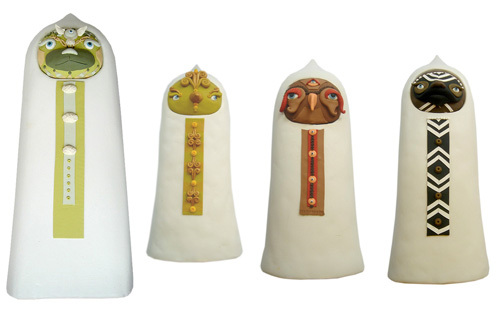 She thinks "of the surface of clay as a canvas on which to paint". 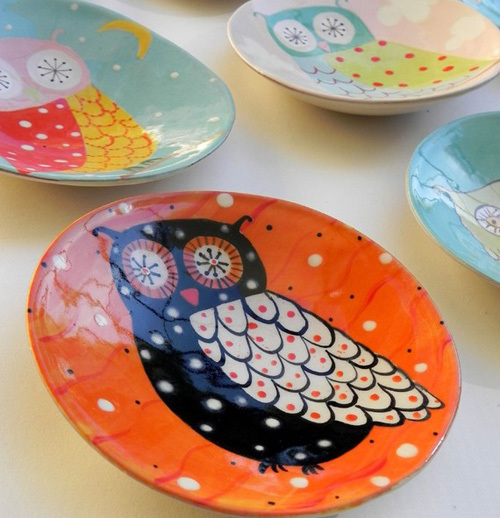 Her whimsical ceramics plates, bowls and cake stands are both functional and beautiful enough to display when not in use. 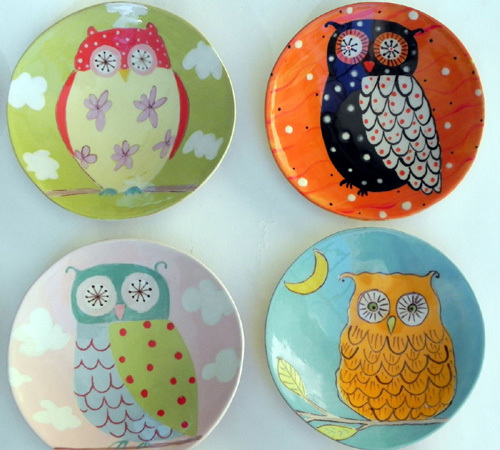 Visit her store for owl ceramics pieces that feature hand drawn and painted illustrations in delicious candy colors. If you wish to see her wonderful pieces in person, she will be at Norcross Arts Festival in Norcross near Atlanta, Georgia on October 1 & 2. 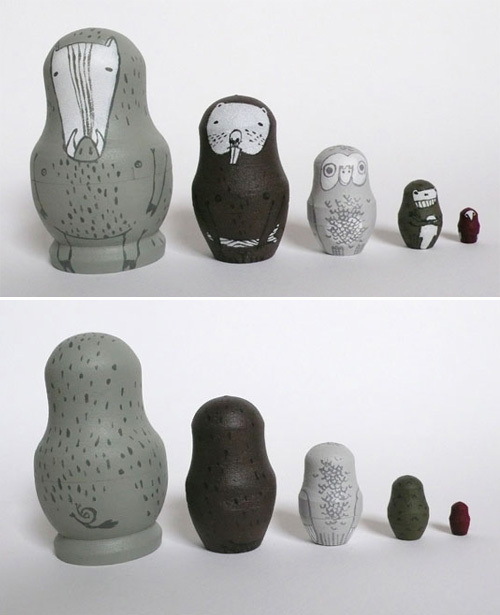 Adorable sets of Matreshkas by Irina Troitskaya, an illustrator born and grew up in Izhevsk, Russia. 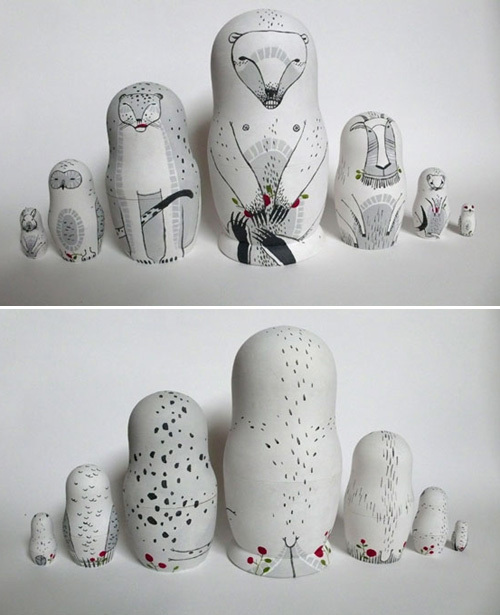 She painted series of Russian dolls, each on a specific theme including white animals like owl, bear, snow leopard, goat, ermine, hare and ptarmigan. I love her sketches too. "Her delicate, surreal and poetic works record those fragile moments of life which hard to capture, because they vanish from our sight in a blink." 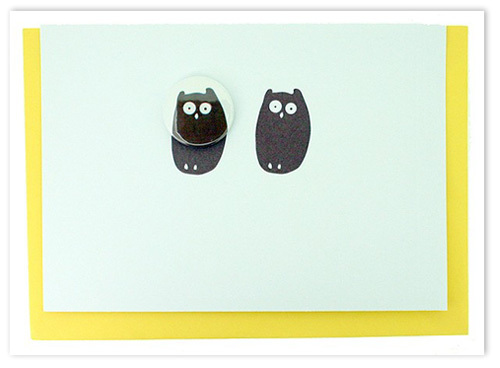 The Black Rabbit is a company based in England that offers unique home products and adorable range of stationery. 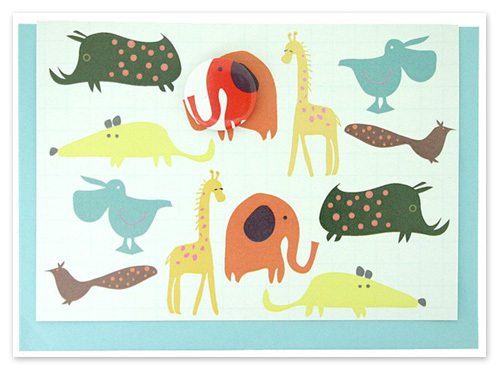 The products are designed and made to order by Lindsay Marsden who started the company in 2006. 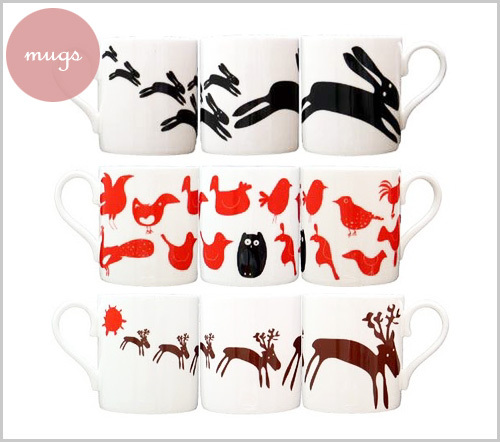 Their cute animal inspired mugs are available in eight simple yet eye catching designs. 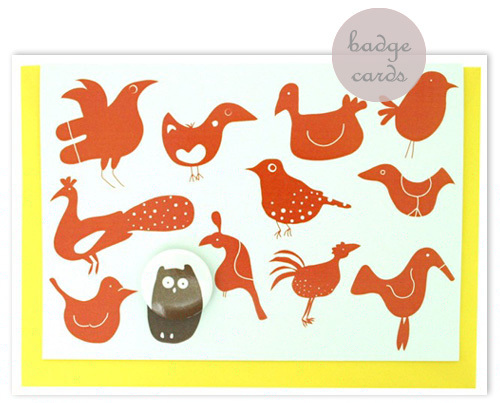 But, I am especially loving their badge cards collection in which each card has a pin as a part of the design. 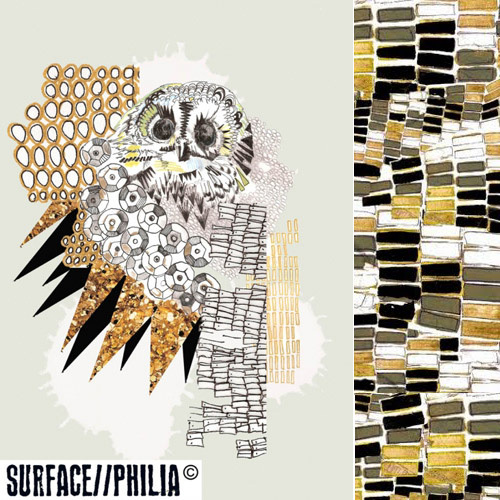 Helen Stevens is a designer and the founder of the brand "Surface Philia".Helen Stevens graduated with a first in BA (Hons) Textiles and Surface Design in 2002 Cleveland College Of Art & Design. Her designs which are usually the "combinations of geometric and organic forms, use of colour and playfulness of scale, merges the boundaries between traditional repeat pattern and large scale illustration". 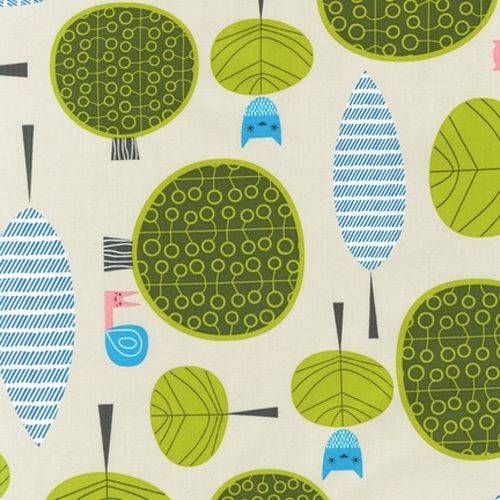 Her current line of products range from printed wallpaper, prints to ceramics. 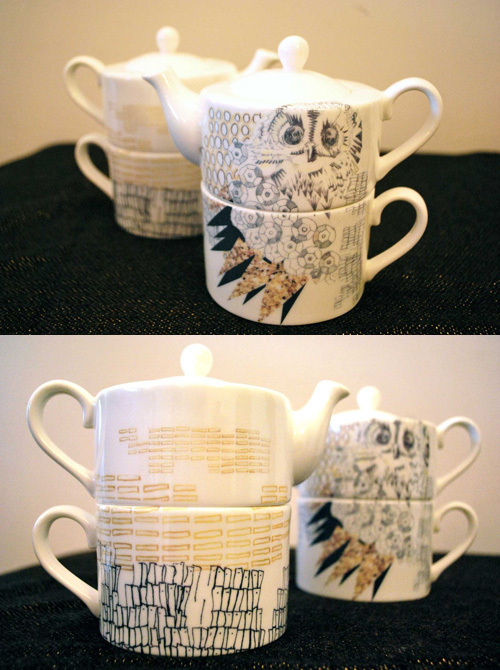 This "Tea-For-One" fine bone china teapot and mug set" features a unique hand-drawn geometric owl design in sophisticated color palette. 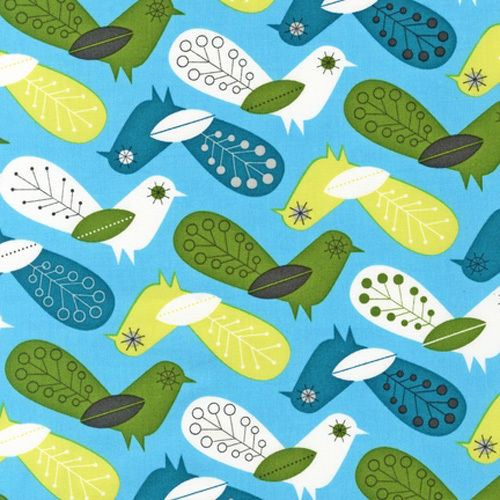 "Critter Community" is a new fabric collection designed by talented designer Suzy Ultman for Robert Kaufman. 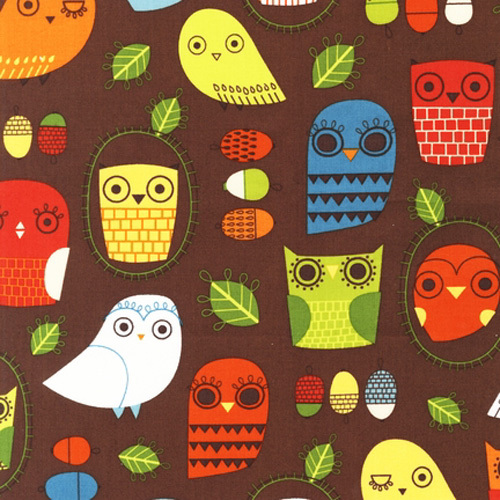 The range features owls, raccoons, deer, hedgehogs and more, and comes in two designs with two color choices "Retro" and "Bermuda". 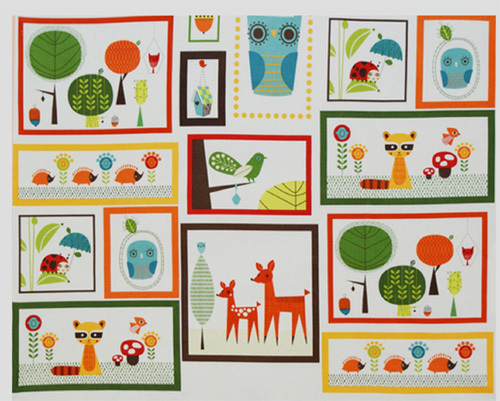 There are also two adorable panels that run the entire width of the fabric which will be great for making a quilt and other projects.